 Burgundy family story Since before the French revolution, the Moillard family has been growing grapes, making and selling wine. Crisp, light-bodied but concentrated, distinctly acidic, with subtle earthy notes joining the choir. So far in this weeklong review of relatively affordable red Burgundies we've looked at the products of a very large negoçiant, Louis Jadot, and a smallish family producer, Paul Pernot et ses fils. Today let's wrap up the week with a look at yet another $15 Bourgogne Pinot Noir from a middle-sized producer, Moillard, an old, established firm that has prospered over more than two centuries in family hands. The company originated as a vine grower in Nuits-Saint-Georges before the French Revolution in 1789, according to the Moillard Website. Paterfamilias Symphorien Moillard, inspired by customers flooding into the Cote d'Or after newfangled rail service began on the Paris-Lyon line in 1850, became a negoçiant, assembling wines from smaller producers and selling them under the family label. Over the years, the family's properties have grown, and nowadays it produces respected wines from more than a dozen Burgundy appellations; it also owns Domaine du Château d'Eau in Languedoc, producing Vin de Pays d'Oc table wines; and they've recently acquired vineyards in the Dealu Mare region of Romania, of all places, planting primarily Pinot Noir, of course, along with a bit of the traditional Romanian red grape variety Feteasca Neagra. 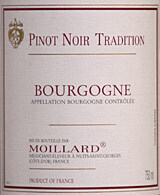 Moillard's 2004 Bourgogne Pinot Noir Tradition came highly recommended from a trusted local merchant, Gemelli Wines in Louisville. It wraps up the week with another fine example of Burgundy at the low end, demonstrating that while you may not get Grand Cru or Premier Cru complexity and ageworthiness in simple Bourgogne, you won't pay Grand Cru prices either; and the wines we've tasted this week absolutely justify their mid- to upper-teens prices in quality and value. If you're serious about the pursuit of quality and value in Burgundy, I invite you to seriously consider our upcoming Terroirs of Burgundy tour this summer with French Wine Explorers. Aimed directly at thrifty, value-seeking wine lovers, we're planning a serious exposure to the best of Burgundy at a "QPR" price. See below for the details, or feel free to contact me by E-mail at wine@wineloverspage.com if you'd like to know more. FOOD MATCH: Beef is a classic pairing with Burgundy, and pan-seared grass-fed Green River Kentucky rib eye steaks made a perfect companion. VALUE: Consistent with this week's other Burgundy reports, this well-balanced, fresh Bourgogne justifies its mid-teens price. WHEN TO DRINK: Like the other relatively modest Burgundies featured this week, it's not meant for cellaring, but also like the others, it might be worth a try if only because even low-end Pinot Noir can suprise you - for better or for worse - with cellar time. Moillard's Website is available in French and English. Click the small "FR" or "ENG" icons for the language of your choice. 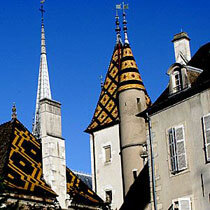 Speaking of Burgundy again, what wine lover hasn't dreamed of touring this great wine region, meeting its wine makers, learning about its wines and dining in its characteristic restaurants and bistrots?